Parsley, from the Umbellliferae plant family, is a very nutritious herb providing a good source of vitamins A, K, and C.
The fragrant oil from this herb is also used to make perfumes. Choosing: Whenever possible, choose fresh parsley over the dried form of the herb since it is superior in flavor. 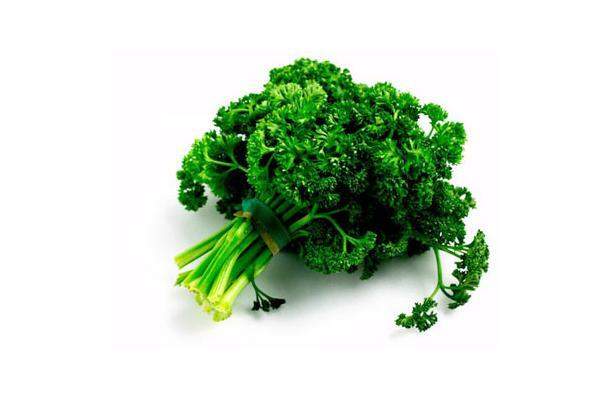 Choose fresh parsley that is deep green in color and looks fresh and crisp. Avoid bunches that have leaves that are wilted or yellow as this indicates that they are either overmature or damaged. Just like with other dried herbs, if you choose to purchase dried parsley flakes, try to select organically grown parsley since this will give you more assurance that the herbs have not been irradiated. Buying: You can buy parsley from supermarkets or your local herb store. Procuring: Choose a location to grow your parsley. It grows best in a well-drained, alkaline soil in full sun or partial shade. Parsley grows well in containers and is a good plant for your kitchen windowsill. Just be sure to have good drainage in your pot and make sure it gets good sunlight. Plant your seeds in the early spring, summer or autumn. Place the tiny seeds on top of the soil and keep moist until germination, which is 2 to 3 weeks. Thin the seedlings to about 3 inches apart. Planting is required yearly in most areas, but it is a biennial in warmer climates. Water your parsley deeply at least once a week and don't allow the soil to dry out between watering. Light mulch helps retain moisture and keeps weeds under control. It is a widely used culinary herb that is most often used to garnish food but can also be added to food to impart a mild flavor. Eating parsley leaves is thought to freshen the breath and help with digestion. In some countries certain types of parsley are used as garnish for plated dishes. In India it is known as ajmoda and is used in soups, vegetable curries, and chutneys. Cleaning: Rinse the parsley with cool water and wrap it in paper towels. Sprinkle water on the paper towels and place them in a sealable plastic bag. Store this bag in the vegetable bin in your fridge. Using old parsley in recipes can ruin the entire dish, since parsley loses flavor when it is not fresh. In order for your recipes to turn out the way you expect them to, you must use the freshest ingredients. Wilted and dying parsley may lend less parsley flavor than you wanted. Buying cut herbs at the market can be very expensive, so keeping your parsley fresh is critical. Be sure to purchase fresh parsley to start with. Look for brown or wilting leaves, and choose only the greenest, freshest-smelling parsley. Store your rinsed parsley in a "green" bag as an alternative to the above Steps. Make sure all moisture is removed from the cut parsley and store in the "green" bags for a couple of weeks (see Resources below). These bags keep produce fresh for over 2 weeks. Keep this bag of parsley in your fridge. History: Parsley is, by far the most commonly mentioned of herbs in recipes all over the world. It has been greatly sought for its medicinal uses, getting mentioned by none other than Hippocrates himself as a cure for a variety of ailments. It is mentioned by the ancient Romans in the forth century BC. Two types, one with dense crowded leaves the other with open, broader leaves are described. Pliny, in the first century AD writes that there would not be a salad or sauce served without parsley. The Ancient Greeks crowned winners of major sporting events with wreaths of parsley. One rumour had it that you could bring about the demise of an enemy by plucking a sprig of parsley while speaking his (her?) name. However, it is used in the Hebrew celebration of the Passover as a symbol of rebirth. In Medieval times revellers placed it on their tables and around their necks to absorb food odours. It was also used as a poison antedote.